Welcome back! 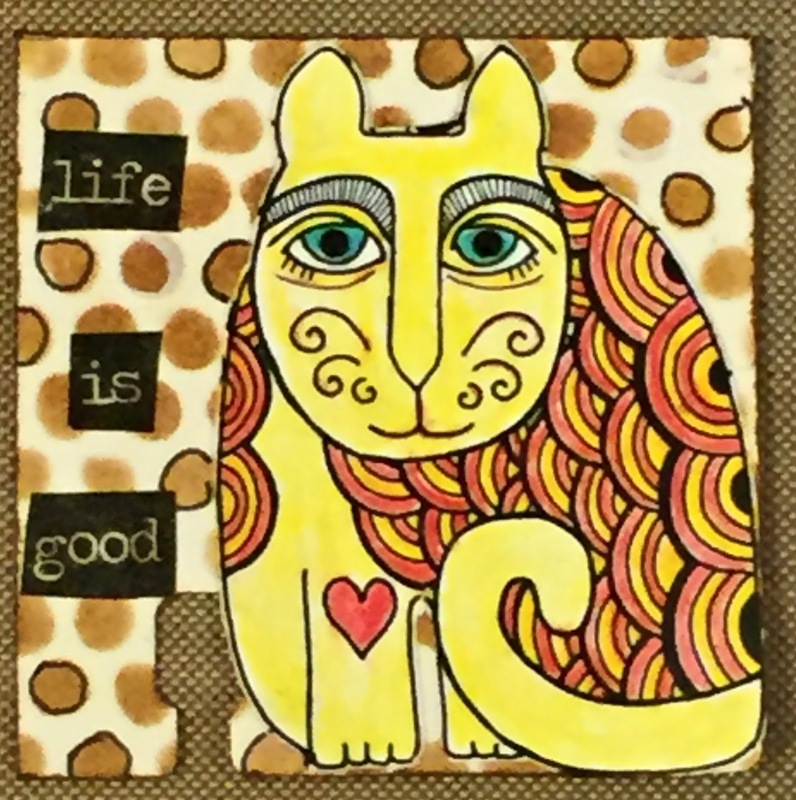 We are now in Day 3 of our Here Kitty, Kitty event and things are winding down. 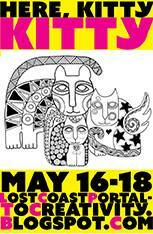 Don't forget to join us in all things Kitty. Just link up your creation by Midnight PST on May 25th for a chance to win some LCD/CV rubber. So, on this final day of the event, we are sharing even more inspiration. 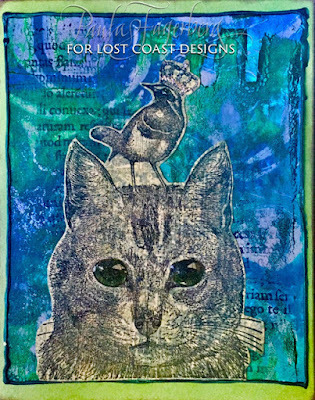 LAURIE is back with two more French Kitties ATCs using the Cat Wavy Face www.lost-coast-designs.com/new.html and Zen Circles stamps. 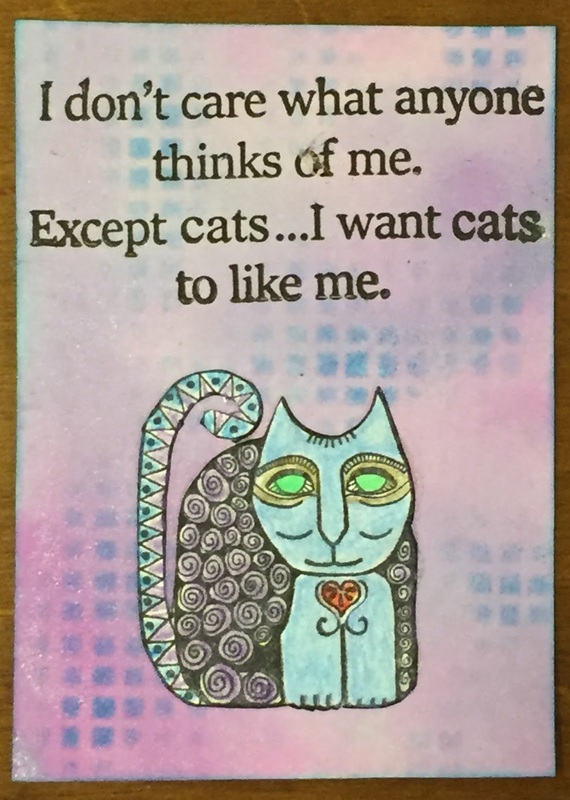 CATHY brings us her My New Collar Card made using Happy Cat. 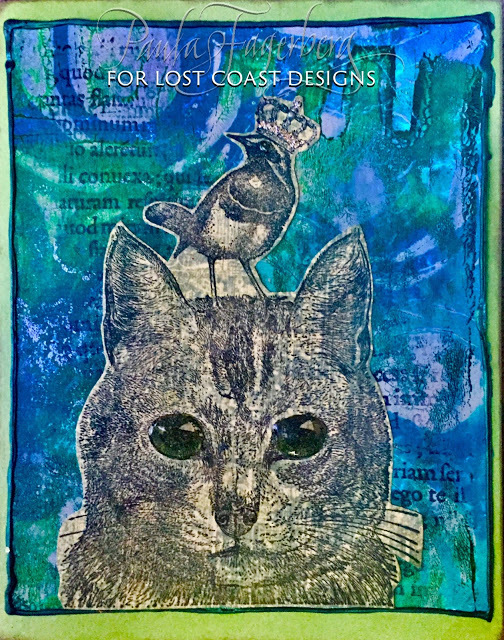 PAULA shares her A Friend is Good to Have Card created using Cat & Bird and the Latin Text from ATC Set 2.
and last but not least, MARILYN shares her Cats Like Me ATC made using the small cat from Cat Trio 1 and CV Cats Like Me stamps. Don't forget, link up HERE for a chance to win. If Here Kitty, Kitty isn't for you, don't forget out Challenge #36 - Use Faux or Real Stitching. Welcome back! It's Day 2 of our Here Kitty, Kitty event. 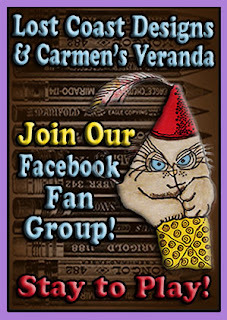 Please join in all the fun we are having creating all things Kitty! 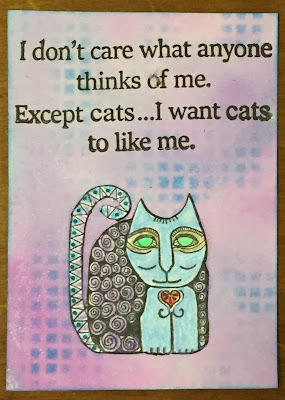 Anything having to do with cats is fair game and you are free to use any company's rubber stamps. 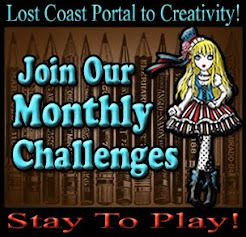 You have until Midnight PST on May 25th to play for a chance to win some LCD/CV rubber. 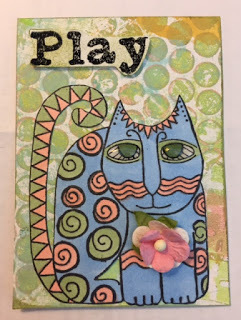 CATHY created her Squirrel in Traffic Tag using the Happy Cat and CV Cool as a Cucumber stamps. MARILYN created her Life is Good Twinchie using the smallest cat in Cat Trio 2. 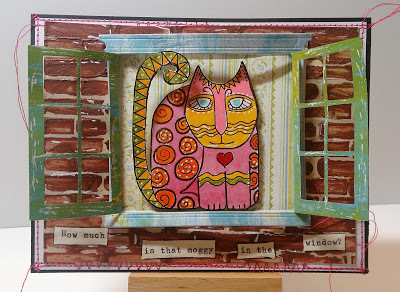 SUE created her How Much is that Moggy in the Window Card using Cat Wavy Face. 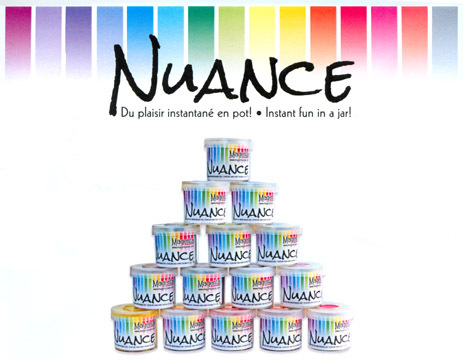 Okay, your turn! 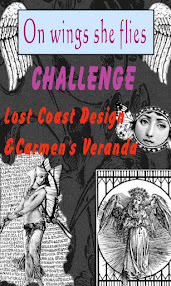 Just link up your project HERE for a chance to win. We'll be back tomorrow for Day 3 and more inspiration from our designers. 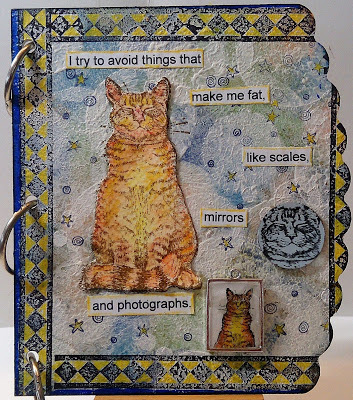 If Here Kitty, Kitty isn't for you, don't forget our Challenge #36 - Use Faux or Real Stitching. It's now halfway through May and that means it's time for some mid-month inspiration. 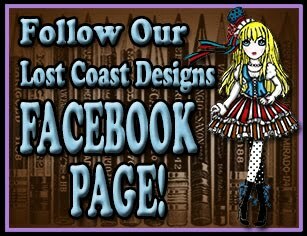 Once again, our designers have been busy creating projects to uplift and inspire you. Enjoy some fabulous mid-month inspiration! 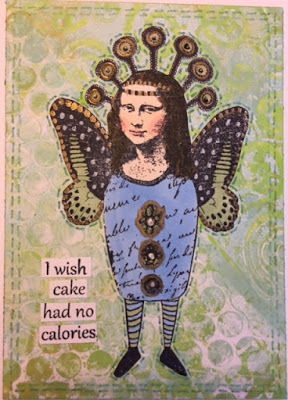 LAURIE created her Can I have my Cake and Eat it Too card using Mona Flying and CV Pets Live Longer. 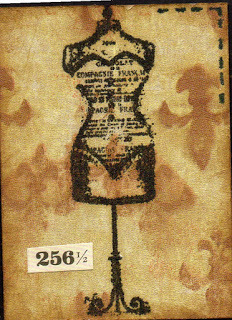 LAURIE created another card using Steampunk Typewriter Girl. 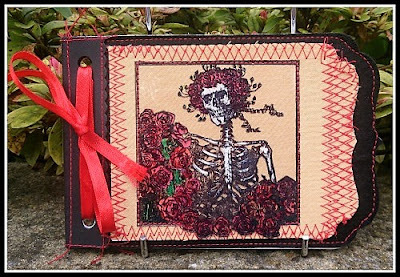 SUE created her Your Don't Bring Me Flowers Mini Album using Skeleton and Roses. 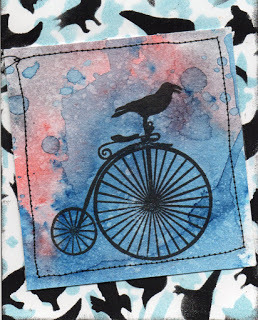 CATHY created her The Birds and The Wheels Keep Turning Cards using Bird on a Bike and Nuance Powders. 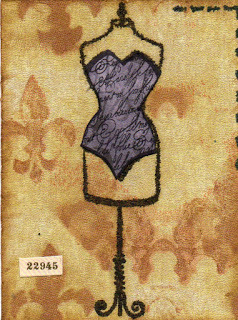 CATHY also created this ATC Trio set using Mannequins. As you can see, out team has been very busy making sure you have plenty of inspiration! Don't forget, submit your entries in the linky party below by midnight PST on the 25th! Our next challenge begins June 5th. It's time for our new Challenge for May but first we have the WINNER of Challenge #35 to announce! We had a TON of entries for the Favorite Background Challenge and once again you all made it soooo hard to pick a winner. 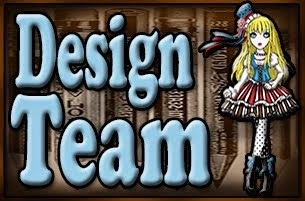 Congratulations "SewPaperPaint"! Please email Marilyn (mcgoo4@gmail.com) by the end of the month to claim your prize of a $10 gift certificate. 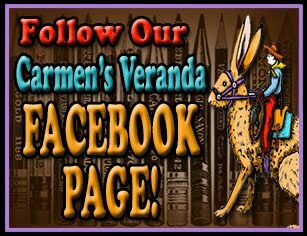 Please provide your full name and mailing address in the email as well as the stamps you would like, you may choose from Lost Coast Designs and/or Carmen's Veranda! Now for our May Challenge! This one is easy. 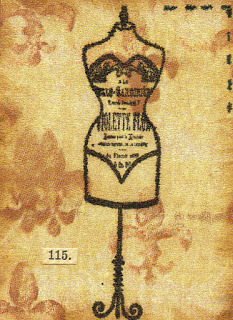 Just use faux stitching (if you are like me and don't have a sewing machine) or real stitching somewhere on your entry (don't forget to include some stamping!). That's it! 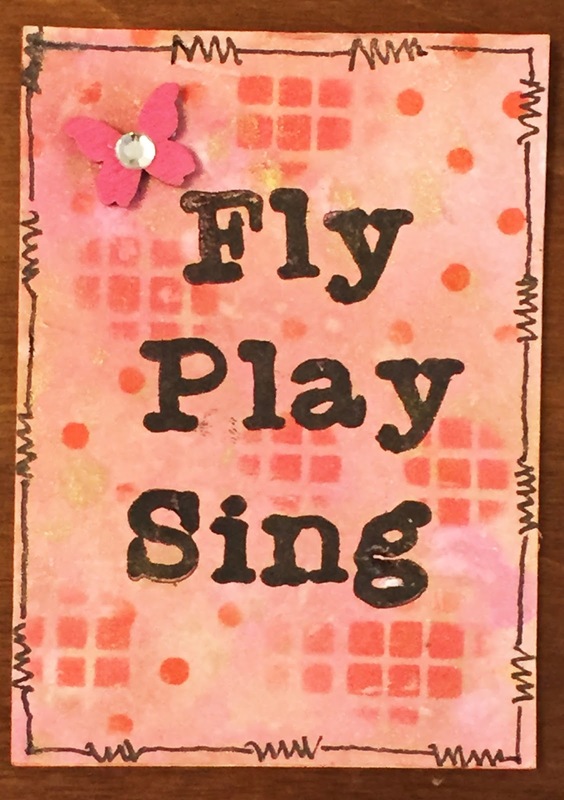 LAURIE create her Best Friends card using Milo and Raphael and CV Postcards Background. 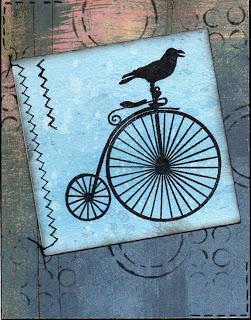 LAURIE also created her Steampunk Typewrite 1 card using Steampunk Typewriter 1. 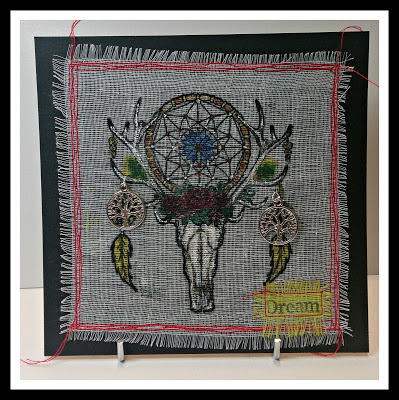 SUE created her Dream wall hanging using Medium Elk Skull and Miscellaneous Words. 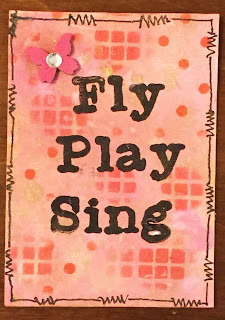 MARILYN created her Fly Play Sing ATC using CV Fly, Play, and Sing clear stamps.